So you couldn't keep your little one away from Barbie. Don't consider it a defeat, just offer your kid a more sustainable place for the plastic dolls to play. Miniio modern designer dollhouses are sustainably crafted and while they offer gorgeous eye candy to you, they're sized just right for Barbie or other similar fashion dolls your kids may love. We think Barbie would ditch her bubble gum pink plastic dream house for this rad pad any day. Miniio modern dollhouses are all made by hand from wood, metal, stone, and a few other modern, yet non-toxic and food-safe materials. The houses are finished with natural beeswax. The impressive homes are sized down from reality six times, which makes them just right for 30cm fashion dolls – Barbie included. The line of dreamy dollhouses was created by two moms who ironically are moms to boys, not girls. But the designer duo say they still love pink dresses, silk ribbons, dressing up in ball gowns and playing with dollhouses. 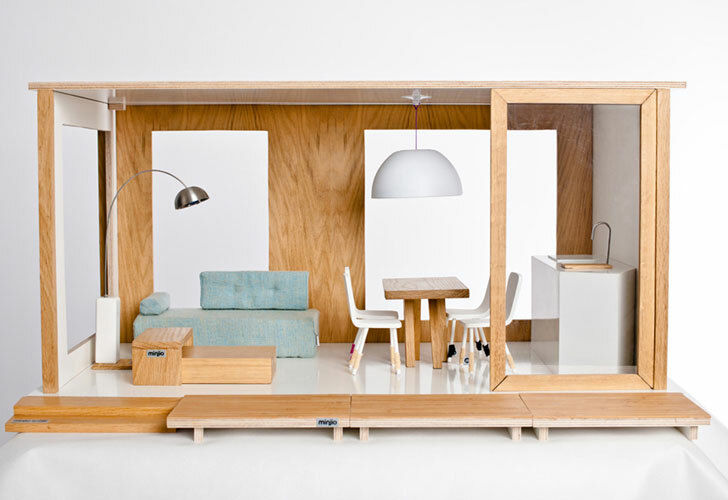 Start building your Miniio dollhouse with the Miniko dollhouse, which comes either furnished or unfurnished. The 1-story house has a beautiful panoramic window, which is not only drool-worthy, but it also makes play easy to access from a variety of angles. A sofa, lamps, side table, dining table and chairs, and kitchen come in the furnished version. Need more space for the doll family? Add on the Miniiko Extension Module, which is basically a second story you can stack on top of the first – no screws or glue required. You can also add a modern bamboo terrace for a patio or to put poolside. If your child loves decorating dollhouses, the selection of Miniio furniture will surely thrill her. Destined to inspire a few pint-sized interior designers, Miniio offers 13 a la carte furniture options. All of the pieces are in the same modern and minimalistic style as the home, with sleek lines and sustainable construction. Miniio modern dollhouses are all made by hand from wood, metal, stone, and a few other modern, yet non-toxic and food-safe materials. The houses are finished with natural beeswax. The impressive homes are sized down from reality six times, which makes them just right for 30cm fashion dolls - Barbie included. The line of dreamy dollhouses was created by two moms who ironically are moms to boys, not girls. But the designer duo say they still love pink dresses, silk ribbons, dressing up in ball gowns and playing with dollhouses. Need more space for the doll family? Add on the Miniiko Extension Module, which is basically a second story you can stack on top of the first - no screws or glue required. You can also add a modern bamboo terrace for a patio or to put poolside. If your child loves decorating dollhouses, the selection of Miniio furniture will surely thrill her. Destined to inspire a few pint-sized interior designers, Miniio offers 13 a la carte furniture options. All of the pieces are in the same modern and minimalistic style as the home, with sleek lines and sustainable construction.